Did you know that wall-to-wall carpet from just one standard 12 x 15 ft room takes 8 gallons of oil and 900,000 BTUs to make, and when you get rid of it, it adds 90 pounds of bulky waste to a landfill? Because using reclaimed materials saves them money, many carpet manufacturers offer to recycle old carpet for free. Through a process of depolymerization and purification, carpet materials like nylon 6 can be recycled into carpet pad, building materials, auto parts, and even more carpet. Recycled carpet tiles, for instance, are really taking off. Most measure between eighteen and thirty-six inches square, and come in vibrant colors and patterns that you can combine any way you like to create your own design. 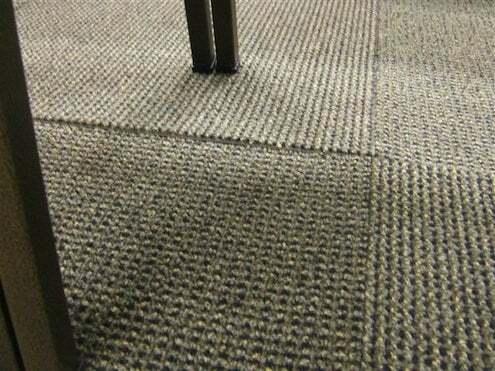 Carpet tiles are easy to cut with a utility knife and have a tacky backing so you don’t have to adhere them permanently to the subfloor. So when someone stains the carpet, you don’t have to panic; just peel the stained tile up and replace it! Check out carpetrecovery.org to find carpet recycling contractors in your area.